Journalist Mikael Blomkvist (Daniel Craig) has lost a libel case against businessman Hans-Erik Wennerstrom. At the same time Lisbeth Salader (Rooney Mara), a socially inept hacker deemed unfit to live on her own, has fallen in the care of a corrupt lawyer when her guardian had suffered a stroke. Blomkvist is summoned by industrialist Henrik Vanger (Christopher Plummer) to investigate the disappearance of his great-niece Harriet, whom he suspects has been murdered 40 years ago. 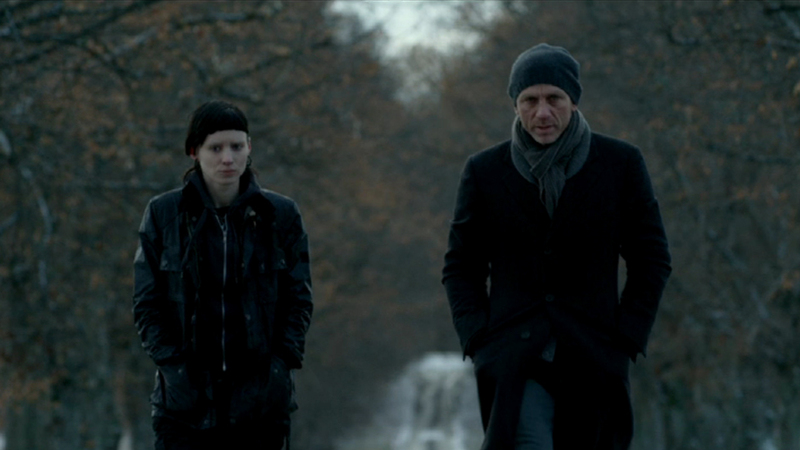 The Girl with the Dragon Tattoo is an American adaptation of the novel by Stieg Larrson. I have to admit I did the wrong thing by watching this movie without having read the book. Despite not having read the book, I can say The Girl with the Dragon Tattoo had the best mystery story I have seen in recent memory. To be fair, the last real mystery I saw was Take Aim at the Police Van, which wasn’t really a masterpiece in terms of film writing, adapted or otherwise. Much of it was how the characters were developed. Mikael’s and Lisbeth’s stories were disjoint until their paths crossed about halfway into the movie. Considering what was going on with Lisbeth (the scene where she was brutally raped by her new legal guardian comes to mind), I admit I found myself sighing in relief whenever the movie focused back on Mikael. That was largely because of what a fine performance Rooney Mara gave as Lisbeth. The movie is about Swedish characters in Sweden because it was based on a Swedish novel. Of course since it is an American movie, everyone spoke English. However, Rooney Mara, an American actress, gave Lisbeth a slight Swedish accent. Actors giving their characters accents is hit or miss, usually miss, but it worked really well for Lisbeth. Daniel Craig, on the other hand, just stuck with his native English accent for Mikael, which worked for the sake of the movie. Craig held his own on screen for the most part, but Mara’s acting was definitely the better one of the lead performances. Between the two characters, Lisbeth was the more challenging one as her personal story was a very intense one. Still, I will give Daniel Craig that he demonstrated that he very much is capable of playing roles that are not James Bond (see Quantum of Solace), as the meek Mikael isn’t someone you would expect to be anything like the British superspy. What I liked best of this movie was the meticulous mise-en-scene throughout. As it is, Craig and Mara had great on-screen chemistry. Northern Sweden in wintertime has more or less arctic weather, yet it the movie looked really beautiful, especially on the island from which Harriet disappeared. Sound played a critical role in many scenes, such as when Mikael was snooping around in a house toward the end of the film, and this was augmented by a great, haunting soundtrack composed largely of electronic tunes. Due to the fact that I was in school this past summer, I was unable to see many movies in theaters this past year. Among the few I have seen that came out in 2011, I will definitely say that The Girl with the Dragon Tattoo is the best one. I only hope you’re not too offended by a lot of product placement. I do have to warn that this movie is not for the faint of heart as it explores the darker side of humanity, throwing up some very disturbing imagery in the process.